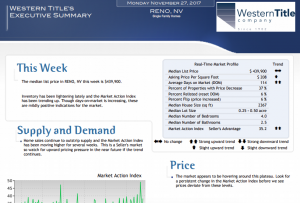 Brought to your by Western Title Company, your weekly market report is here! The median list price in RENO, NV this week is $439,900. Inventory has been lightening lately and the Market Action Index has been trending up. Though days-on-market is increasing, these are mildly positive indications for the market. To view, click the link below.